Cromptons Quality Furnishers – Selling Quality Furniture in Cumbria since 1981. Cromptons Quality Furnishers of Grange-Over-Sands in South Cumbria was founded in 1981 by experienced furniture retailer, Edward Crompton. The business has grown dramatically over the decades both in product range and in reputation throughout Cumbria. 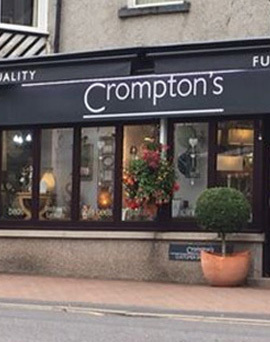 Now owned by Barbara Purcell, Cromptons Quality Furnishers continue to provide high quality upholstery, carpets, furniture and home accessories, together with a fantastic service to our customers. Alstons Upholstery. Relax Seating, Vale Bridge Craft, Celebrity Motion Furniture, Freeform by Nathan and Healthbeds, are also among the popular furniture brands to be found in our Cumbria furniture showroom. We source the best that carpets and flooring can offer, from carpet manufacturers Ulster, Penthouse, Roger Fells and Ryalux, to name just a few.